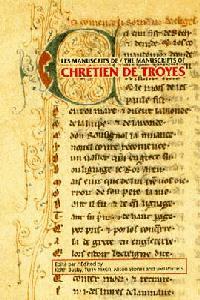 hrétien de Troyes (died c. 1185) was probably the greatest medieval writer of Arthurian romances. Of his life we know neither the beginning nor the end, but we know that between 1160 and 1172 he lived, perhaps as herald-at-arms (according to Gaston Paris, based on Lancelot lines 5591-94) at Troyes, where was the court of his patroness, the Countess Marie de Champagne. She was the daughter of Louis VII and of Eleanor of Aquitaine. It appears from contemporary testimony that the authority of this celebrated feudal dame was weighty and widely felt. he old city of Troyes must be set down large in any map of literary history. For it was there that Chrétien was inspired to write four romances which together form the most complete expression we possess from a single author of the ideals of French chivalry. These romances, written in eight-syllable rhyming couplets, treat respectively of Erec and Enide, Cliges, Yvain, and Lancelot. 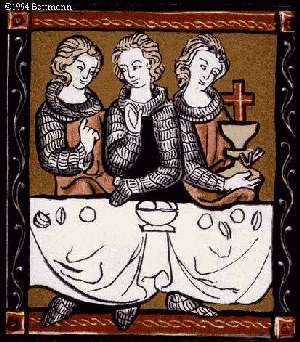 Another poem, Le Roman de Perceval ou le Conte du Graal, was composed about 1175 for Philip, Count of Flanders, to whom Chrétien was attached during his last years. It was left unfinished at his death after he had written more than 9000 lines. t is commonly accepted that Chrétien based his story on Celtic sources, one such candidate being the story of Peredur, a version of which would be incorporated into the collection of Welsh legends known as the Mabinogion. This would explain Chrétien's Perceval the Welshman . The tales known as the Matter of Britain might have arrived in Brittany with refugees from the Anglo-Saxon conquest of England. That there was migration during the fifth century, beginning perhaps as early as 380, is mentioned by writers such as Nennius (c.800). Procopius, the Byzantine chronicler, recorded that both Britons and other peoples, in need of land for an expanding population, migrated from England to western Gaul and to north- western Spain, where they were allowed to settle on depopulated land. Continued contact with kin in England can be assumed and so it is likely that songs and stories circulated on both sides of the Channel. The surviving but fragmentary Welsh/Breton literature suggests a rich tradition from which Chrétien and other writers shaped the Matter of Britain.